I saw this article today and loved reading it. As a member of the church in the Philadelphia area we are so excited for the coming Temple. Our current journey to the Washington DC Temple is 2.5 hours each way (unless you hit traffic, then it's MUCH more). And while there is a beloved Cafe Rio near the DC Temple, I will love to get to go to the closer Temple when it's finished! 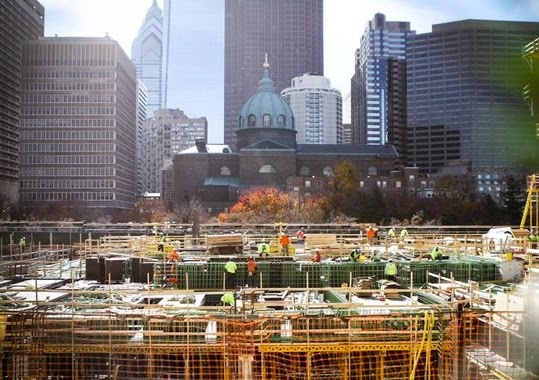 It's been two years since ground was broken in Center City on a massive Mormon temple and visitors' center, and it might just be one of the more remarkable construction sites in recent city history. Let’s just say the Church of Jesus Christ of the Latter-day Saints (LDS) goes by its own rules — not those typically found in local union handbooks. And it makes sure those rules are enforced. No smoking. No coffee. No swearing. Praying optional — but encouraged. To the union workers toiling away on-site, the 60,000 square foot project is vastly different from any they've undertaken before. At the time of the ground-breaking, Mayor Michael Nutter hailed the project at 18th and Vine Streets for its projected infusion of millions of dollars into the local economy, as well as the 300 construction jobs it would create. Church officials contend the worship site is much-needed to serve the Philadelphia area’s estimated 35,000 parishioners. The closest area temples are in Manhattan and just outside of Washington, D.C. He said after the temple plans were announced in 2008, it took church officials between six and eight months to find the right property to build on. They then went forward with the purchase and planning of the project. Though Philadelphia has plenty of experience handling large construction projects, when it comes to building sacred spaces, local building officials must bow to church leadership headquartered in Salt Lake City. 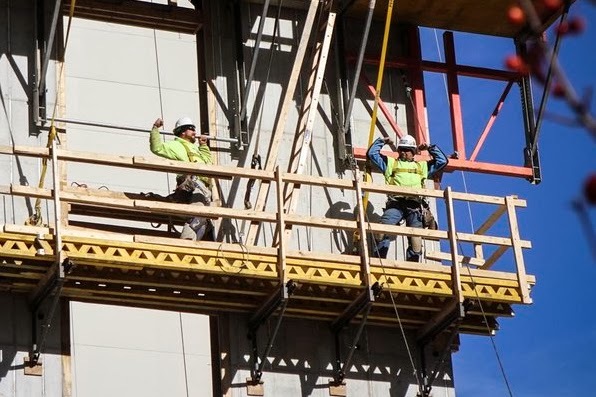 The international LDS temple department is responsible for both commissioning and funding the project, as well as drawing up contractor agreements that contain some unusual requirements. "There's no smoking or coffee drinking, and, obviously, no booze or anything like that on the site, at all," said Pat Gillespie, business representative for the Philadelphia Building Trades Council. Workers must go to a break area across the street if they want a fix of caffeine or nicotine. Smith said the church considers the rising temple “a sacred edifice” being built on a site consecrated for its use. 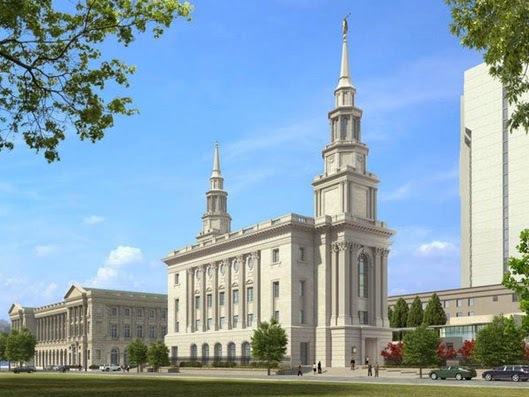 The temple’s building contracts also give hiring preference to union-affiliated Mormon workers in the Philadelphia region. But none could be found, aside from one carpenter who may join the team when his skills are needed during the project’s later stages. As is custom for LDS temple construction, each meeting with foremen and project managers at the Philadelphia site begins with a review of the day's assignments and prayer — all under the watchful eyes of specially-appointed temple minders, who are always on-site to keep vigil over the proceedings. "They're very precise and attentive to the process," Gillespie said, though he asserted any kind of prayer sessions are purely optional. Alex and Pamela Carr moved from Utah and will remain in Philadelphia until the temple’s construction is complete. Alex, with his plaid shirt and rolled-up sleeves, shock of white hair and piercing blue eyes, draws more than a passing resemblance to Paul Newman. When speaking, he easily lapses into folksy sermons, moving from pleasantries to parables and back again. He can rattle off at length endless facts about the tenets and customs of his faith — and bake a mean cookie. Located in the site’s parking lot, the visitor’s center is appointed with large poster boards depicting renderings of the temple and stacks of leaflets and literature about the LDS faith. Visitors are encouraged to take a pamphlet, a handful of candy from several glass bowls or a chunk of rock. That’s another symbolic aspect of the construction. When workers dug about halfway down into the 30-foot pit that will serve as the temple’s underground parking garage, they hit granite. Many people would see the development as a setback — it took about six months to chip through — but Alex Carr saw it as a teaching moment. It brought to his mind a scripture passage in which Christ said a wise man builds his house on rock so it’s not toppled by winds and rains. Each day the granite was exposed, Carr climbed down into the pit and returned with bucketfuls of rocks. He began giving them away to visiting youth groups and missionaries as a visual reminder of the importance of building one’s life on firm footing — the rock, of course, serving as an analogy for faith. He’s amassed an estimated 2,000 pieces of granite but expects he’ll soon run out: demand has been high. Soon, Carr plans to hold weekly Monday morning “job prayers” over the site, its workers and building materials. Though all of the project’s 100 workers are invited, attendance will be optional. He’s not sure anyone will show up, but he feels the temple's construction is just as special as the worship services that will eventually take place inside the finished temple. Smith pointed to the ritualistic regulations as evidence of the Mormons’ precision and pride, tenets he indicated have spread to the lay workers on site. He said the church is using top-notch building materials and enforcing safety rules and site inspections “to the highest standards.” For example, church officials looked at thousands of types of granite for the temple’s edifice before settling on one sourced from an island off the coast of Maine and shipped down from Quebec. Construction is “right on schedule” for a 2016 completion, according to Anderson. In August, the majority of concrete was poured for the substructure and two levels of underground parking are nearing completion. 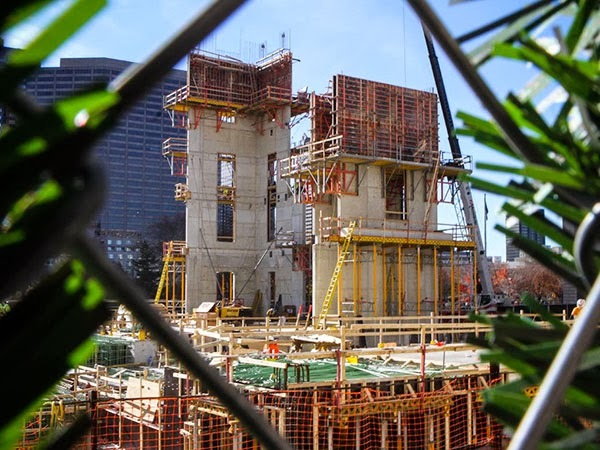 Workers are hoping to begin steel work in January on the temple, which will rise four stories above ground, or about 75 feet above the sidewalk. The exterior walls are slated to begin to rise next summer. The building’s tallest of two spires - the east spire - has been meticulously measured so to be level with the tops of the adjacent Free Library of Philadelphia and family court buildings. The spire will be topped by a statue of the angel Moroni. The inside of the temple will have a Colonial feel riffing off Independence Hall, with rugs instead of carpeting and wood that’s painted - never stained. Despite some of the more unusual requirements the project entails, Gillespie said he's not aware any of the practices are deterring workers from signing on. "I don't want to make it seem like it's a peculiar job,” he said. “It's a job with some unique requirements, but we're happy to accommodate. The construction workers are versatile and they can adapt. This is what the customer wants, it's a sound request and they're paying the bill. It's going to be a beautiful, beautiful building. This is phenomenal for the city." thanks for posting this, I enjoyed reading it.